Because the truth is, I’m a little nervous about it now. When I’m not editing for St. George News, I write speculative fiction, creating worlds, people and creatures that don’t otherwise exist. And I’m afraid some of that has bled over into my parenting. In our house, in addition to the fictional childhood standards – Santa Claus, Easter Bunny, Tooth Fairy – and the fringe supporting characters like Elf on the Shelf and leprechauns, we also have aliens that like chocolate chip cookies, toys that occasionally come to life and a fairy that lives in the walls. Like most other families, the majority of these characters are seasonal. The leprechauns may stick around past St. Patrick’s Day, their pranks making fodder for occasional dinnertime storytelling, but I’m pretty sure my kids are wise to me on that one. And the aliens and animate toys come around infrequently enough to number among the ranks of the holiday characters who are otherwise forgotten for the majority of the year. 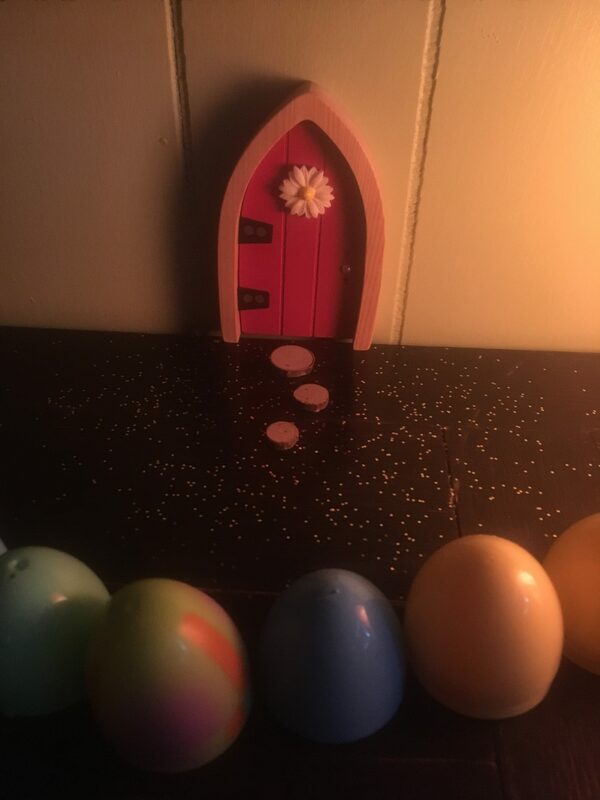 However, the fairy who lives just beyond the 4-inch wooden door affixed to my daughter’s bedroom wall is a different story – because Peace Bell is here almost every day. I dare say she’s a better friend to my daughter than many of her classmates. But that stands to reason. I have created her. I have brought her to life in the mind of my daughter like one of my characters via a series of correspondences – little notes, pictures and trinkets from the fictional realm. But is it fostering borderline dementia to encourage that kind of fanciful thinking year round? Like many parents, I have concerns about my children finding out about Santa Claus, but in our family, the house of cards will be much bigger when it crumbles. As a father, I worry it will be the death of all things magic in the mind of my sweet, imaginative child. And as a creative person, that scares me more than her potential scorn. I still believe in magic. I think this belief is a writer prerequisite, especially spec-fic writers. I believe there are things we cannot see or don’t truly understand, but they still exist. And the stories we tell about these things have power – power to create, inspire, motivate. Christmas is one of the greatest examples of this. Whether it’s the jolly old fat guy who somehow makes it down your chimney or the Virgin Birth, the stories we were told as children, while perhaps forgotten by some of us throughout the year, still linger. And they resurface during the holidays and remind us to be a little kinder to one another. This is what I will tell my daughter – although a little more eloquently – when she finally asks me about Santa Claus. I will tell her our stories hold magic. They hold power, the power to make us better people. And when it comes to the stories we tell our children, for a little while, we can be young again, more carefree and innocent. The world can be a little better place, a place of hope and endless possibilities. Magic like that is fleeting, and you take it where you can get it. I’ll be sad to see Santa fade from fact to fiction, but just because we have to eventually put away childish things, I will continue to encourage her to hold on to her belief in hope and endless possibilities – and maybe a little magic. I’m sure she will never forget Santa. The same will hopefully hold true for her friend Peace Bell. I have saved all their notes back and forth, and one day I will put them together in a collection. It’s my hope that seeing her own words will remind her of the magic she believed existed. The small wooden door will still open into a world of imagination. And maybe when she makes her Nobel acceptance speech, that little collection written in the hand of an 8-year-old girl will remind her there is still magic in the world. The opinions stated in this article are those of the author and may not be representative of St. George News. Great treat for the holidays. Thanks for sharing a little bit of that type of magic. Its a delicate balancing act but done in the right way it can open up new worlds. I don’t see any harm in believing in fairies or santa, tooth fairy, easter bunny. The easter bunny one was always a bit creepy and tooth fairy even more so. There’s a horror film on ntflx with an excellent example of the scariest easter bunny i’ve ever seen. The film may have been called “holidays”, but I may have mixed it up w/ a dif one. More than likely you’ll never have to have a “santa isn’t real” talk. Sometime after 9 they’ll figure that one out on their own. Enjoy it while it lasts.